Do you want to thrive as a mom but it seems next to impossible? Are you stuck in survival mode? You are not alone- keep reading & grab your free printable Thriving Motherhood journal at the end! To thrive as a mom sounded like a dream, an impossible dream to be exact. In 2012, I was in full on survival mode and wondered how I would ever get this motherhood thing right. Can you relate? If so, know you are not a lone and you are in the right place. This series is all about helping you live a focused and thriving life. What is the number one question I hear from other moms? How on earth do I do all of this? Being a mom is such an amazing gift and while it is a rewarding job, it also can be overwhelming. Without even realizing it, you can get stuck in the survival mode cycle. We read the books, search Pinterest for quick mom hacks. As we attempt to be present or choose joy, it seems next to impossible as you stare at the laundry piling up, toys filtering every nook and cranny, and how to stretch the grocery budget. What you thought would be the best system to help your family thrive only seems to cause more stress and more of survival mode cycle. Friend, I have been there and struggled with these exact same things. Right now I am thinking back to 2012 when I attempted to try every single system or routine to help our family thrive only to be left frustrated. In the midst of struggling, I knew something had to change, so I slowly started to change my perspective and slowly I started to thrive. 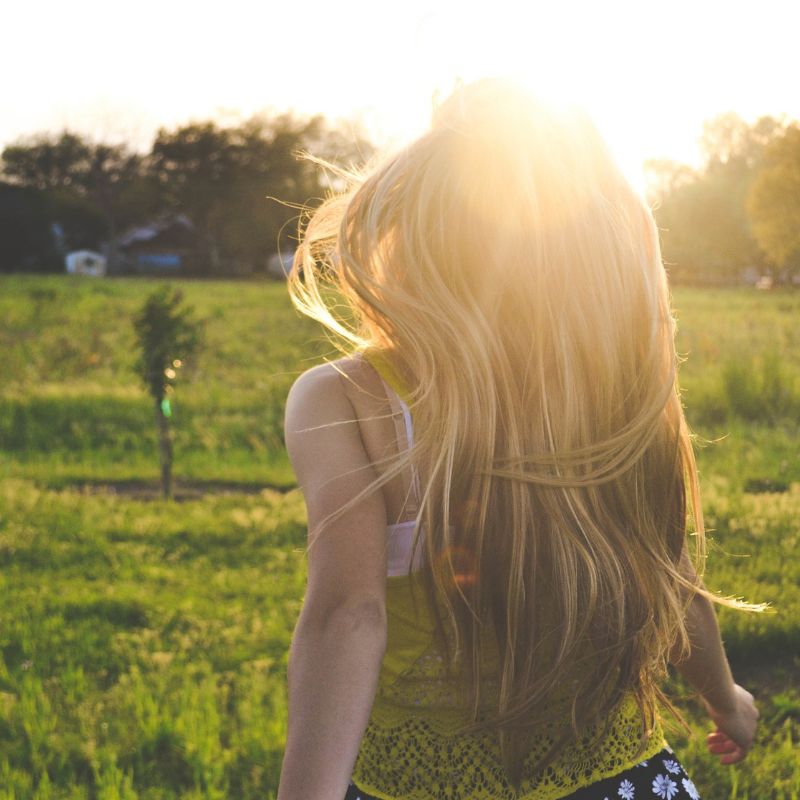 Yes, motherhood is hard and can be overwhelming, but I am here to tell you that you do not have to stay stuck. 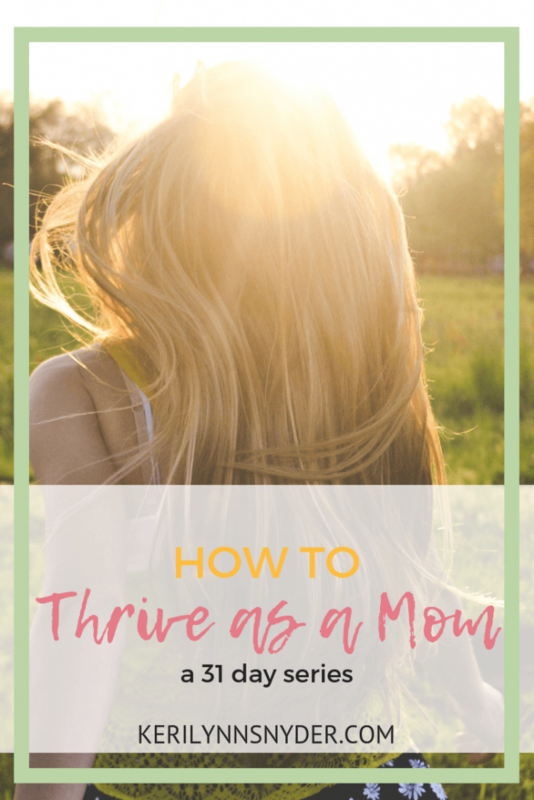 It is possible to thrive as a mom, it just starts differently than you would think. Over the next few weeks, I want to share with you some of the things I have learned that have helped me thrive as a mom. I believe these lessons will help you as well! This series will start out focusing on the heart of the matter, because if we do not tackle the heart, we will not be able to truly thrive. It will then move into more practical tips, because systems and routines can work when done in the right way. Scroll all the way to the end of the post to view links to the posts! 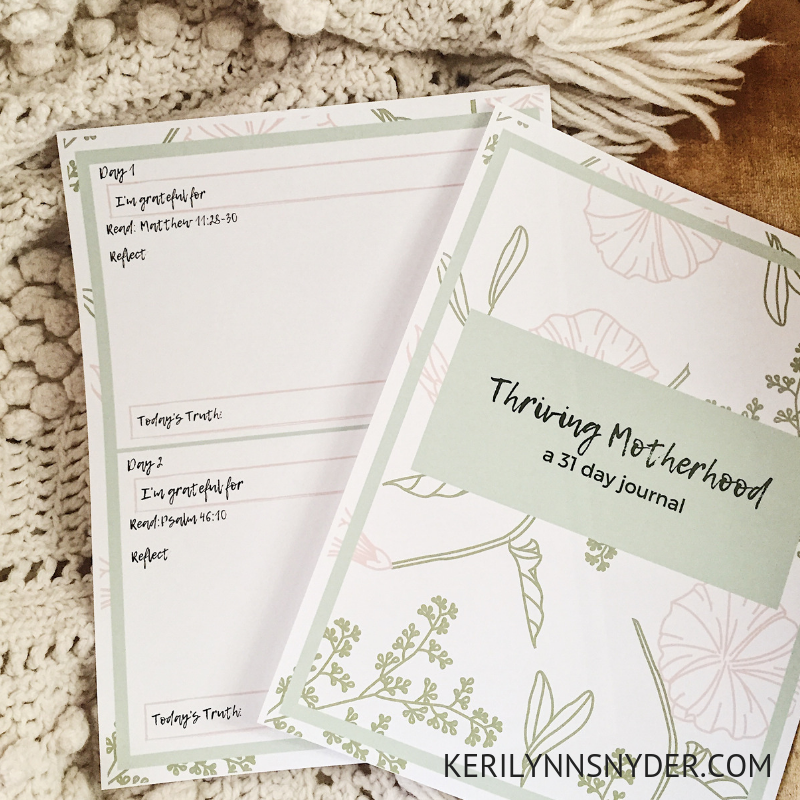 As a way to help you focus, I am sharing with you a special gift, the Thriving Motherhood Journal! This is a printable journal designed to help you focus your heart every day. It is set up for 31 days and every day has a spot to write what you are thankful for, a Scripture passage to read, a spot for reflection, and a spot to write a truth for the day. SAVE THIS POST FOR LATER & PIN THE IMAGE BELOW! I am so ready to try this. I just had my second child and I am really struggling. Morgan, I hope it is so helpful for you! Give yourself grace as you go through it. It is okay if it takes longer than 31 days! I really struggled adjusting to being a mom of two kids. Praying for you right now!